Fitted sheet with face hole made from our most popular cotton jersey material. The 50/50 poly-cotton interlock material is extremely soft, very warm, and a little stretchy. Made from a durable double-knit construction it is designed for no-pill, no run, and no shrinkage. Size: 78" x 35" x 6"
Face hole dimensions: Approximately 12" from elastic and is 6" around. Return Policy: No Returns. See Disclaimer below. 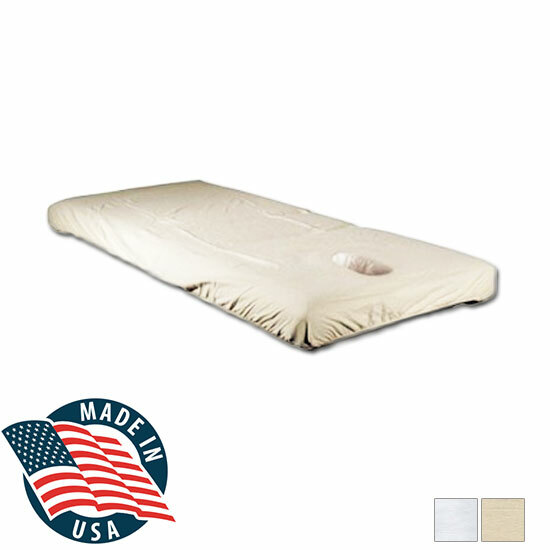 These custom, USA made fitted sheets w/face hole are made from our most popular cotton jersey material. The durable 50/50 poly-cotton interlock double knit construction material is extremely soft, very warm, and even a little stretchy. Designed for no-pill, no run, and no shrinkage this superior fabric is perfect for massage and spa therapy. Made to fit tables 28" to 35" wide and 73" to 78" long. Fabric will drop into the face hole.